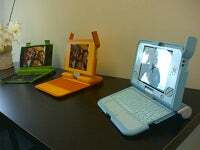 Last year, MIT Media Lab co-founder Nichols Negroponte proposed constructing a $100 laptop that could be provided to every child in regions where owning a computer is prohibitive for most families. The designs have gone through many revisions (the first included a hand crank that could power the laptop), but it seems that the first pictures of the prototype have filtered out onto the Net. I think it looks like a nice little machine, that'll hopefully be perfect for the tasks it's designed for: word processing and access to the Web and email. Getting these in the hands of kids is a big deal, for all of the reasons you can read about on the One Laptop per Child Initiative's FAQ. The plan is to have the laptops ready to ship by the end of this year or the beginning of next. If nothing else, since the laptops are running a distribution of Linux, this could be a substantial dent into the Microsoft monopoly; all of the kids who use this laptop will grow up not using Windows. Interesting to think that the chink in Microsoft's armor might come not from a market competitor, but from the ground up.